In essence we are here to provide you with excellent service. Our clients’ needs can be very different and no two projects are really ever the same. We will always ensure that we match your needs with the OB team member who is best able to help you. With years of experience the OB team can help you through what at times can seem a baffling array of products. Basically speaking bathroom products get water in to your bathroom, deliver the water via a tap or shower or w.c. and then ensure waste products are removed in a sanitary manner. The rest is about quality of design, functionality and manufacture. 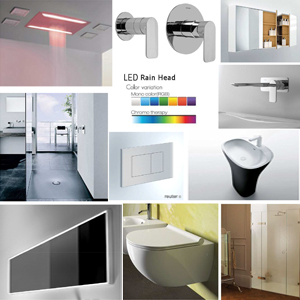 We are here to help you realise your bathroom with a design you love and on budget. As with most things in life it is generally true to say that higher prices mean better quality. 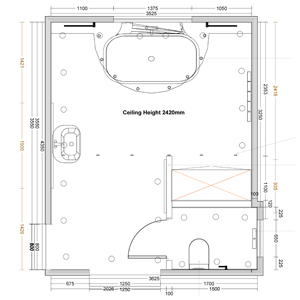 We can produce detailed plans and designs but if you are creating a totally new space you may need the help of an architect. Will you do the work yourself or do you need an experienced professional installer? Consider your space - keeping cabinets, toilet and towel warmers off the floor creates a feeling of more space and is also easier to keep clean. From a simple cloakroom to a luxurious spa, bathrooms provide a variety of functions in the home. You should consider who will be using the bathroom and what experience you require. Will you want to wash the kids or even the dog? May be you need to consider easy access and use for an older or less able bodied person. Or maybe you want to create a luxurious haven to escape to, where you can relax and unwind away from the pressures of modern day life. 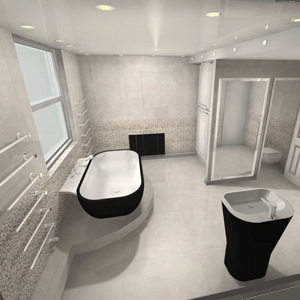 We use a variety of graphics tools in the process of designing your bathroom. The final and right design of your bathroom will come through a consultative process with modifications and tweaks along the way. We can and have worked with plans that vary hugely in detail from sketches on the back of a cigarette packet to full architectural plans. Occasionally site visits are necessary to get ‘a better feel’ of the project and to clarify dimensions. We regularly work alongside our clients’ builders and installers to help keep the project running smoothly. Our years of experience have seen us deliver a huge variety of projects, both big and small. We have replaced soap dispensers in hotels, sourced shower curtains for Hollywood celebrities, fitted out residential blocks of flats, and a whole lot more …. It’s all in a days, sometimes weeks, work here at OB.